Q: What is the Monarch Butterfly? A:The Monarch Butterfly is a pollinator. 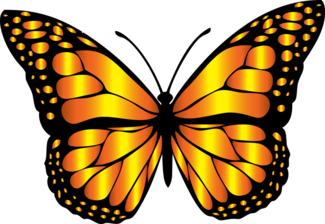 Monarch or “King” Butterfly is a striking orange butterfly that winters in Mexico and and returns north to lay its eggs. It’s two way migration pattern is a sight to behold. Q: What does the Monarch Butterfly eat? A: The Monarch Butterfly needs nectar plants to survive, but lays its eggs only on the common milkweed plant. Different species of milkweed exist, so if you are planting milkweed, check to what species of native milkweed lives in your area. Based at the University of Kansas, Monarch Watch has a great website for you to visit to learn more. Q: Why is the Monarch Butterfly endangered? A: There are many factors in slow disappearance of the Monarch Butterfly. The milkweed plant used to be ubiquitous across the United States. As more and more of the milkweed habitat has disappeared due to farming and human habitation, it’s become more difficult for the Monarch to make its journey. Pesticide use and a changing climate are other factors as well. Q: What is a pollinator? Q: Why should I care about the Monarch Butterfly? A: Everything in the world is interconnected in an intricate food web. While we humans do not generally directly consume plants that monarch pollinate, other species do. And the more holes we have the in the food web, the less healthy it is. Q: So I do care now! What can I do to help? A: Lots of things! Avoid pesticide use in your lawn or garden. Plant native flowers including milkweed so that the Monarch has a place to stop at. Think of it as a “rest stop” on the highway. If there were no places to pull over, you’d run out of fuel and get very hungry and tired!